on his way back home in Portugal. somewhere in the pig stall. Brand Olav gets a trophy to show off at school. The Wilmont family on a flying visit. 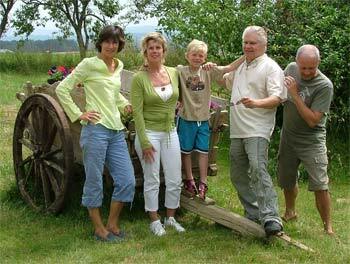 Just after Peter and Marianne left, Peter's older brother, Paul stayed over. He was on his way to his home in Estoril after a visit to Holland. 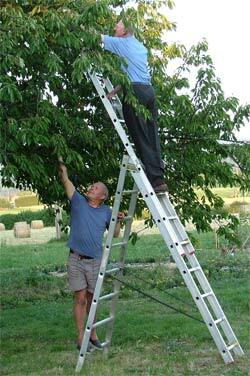 He saw how we had progressed since his last visit and was game to climb a ladder and fill a few pots with cherries. Our friends, Wim and Saskia Wilmont stayed a night during their round trip to Barcelona. It was good to be able to show them the place they had read about and seen on this site. 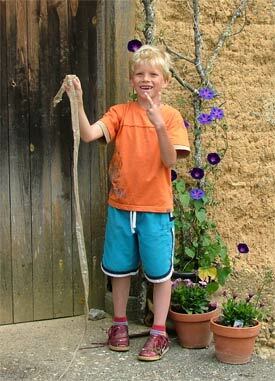 Their son, Brand, loved the bats hanging in the barn and was happy to take a snake skin home. It was 1,7metres long (about 5ft) and completely intact. Perry still cringes at the thought of it! When you get to seeing your fiftieth birthday just two years off on the far horizon, you don't feel like celebrating. Perry spent the day painting a watercolour, reading and taking a siesta in the hammock. Caroline banned him from the kitchen and our quiet corner of the garden where we sometimes eat dinner. He was finally allowed to peak around the bush and was surprised with a beautifully set table, a lavish dinner, delicious wine (thank you Oom Paul) and a few, simple pressies. Aah, she's so romantic. Perry had to fly to London for a business meeting. In all, he was away for two days. Planes, trains and automobiles, long waits at airports and platforms and stifling journies on the London Underground. After a two hour meeting, he had it all to do again. Thankfully, he was able to squeeze in a dashing visit to his mate Malcolm, just in time to see the England v Sweden match in the World Cup. The noise of mobile phones, busy people ignoring each other, big city angst and the ridiculously expensive cost of living convinced him that home in SW France is definitely where the heart is. Workwise, Perry was busy creating newsletters and mailings for West Cornwall Cottage Holidays. Using a lot of images shot while we were there in April to create an impact. Further, he has been illustrating a book of anecdotes for an Englishman who lives in the Gers, which will hopefully be in print in time for Christmas. There is also a possibility of an exhibition of his ink and watercolours in the late summer (if he finds the time to make enough). The rest of the month was filled with some intensive work on the house. Our carpenter called to tell us that he could start a month earlier, so around the 15th of July, our roof will be removed and hopefully three weeks later a new one will be in place. The kitchen should be ready by then and then we can start on a bathroom upstairs. Joy!! It's all to see in Our house, so go take a look. This photo was made three weeks ago. Everything is now soooo much bigger. The potatoes have all just been dug up. The aubergines, courguettes and green beans are a feast each day at the table and the melons and pumpkins are taking over. Now we are waiting on the tomatoes...gazpacho anyone? If you have any great recipes with tomatoes, aubergines or courgettes, please send them. We are going to have more than we can cope with.